Disclosure: This post may contain affiliate links. If you choose to purchase anything through them, there is no extra cost to you. I simply make a small commission from the sale which allows me to keep this site up and running. Thank you for supporting Struggles of a Fit Mom! 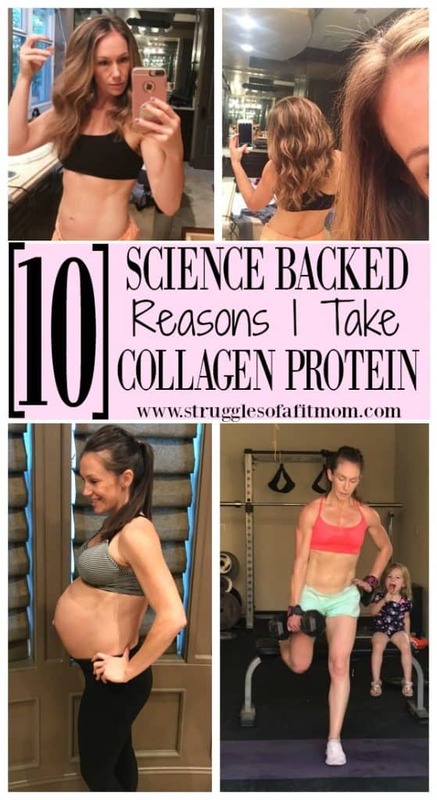 10 Science Backed Reasons Collagen Protein Can Help You Look and Feel Amazing! By now you have probably heard all the rage about collagen protein – and for good reasons. But what exactly is “Collagen” and why do you need to hear more about it? Do you have achy joints? Are you recovering from having a baby? Do you want smoother skin and stronger nails? Or do you just want to reduce some signs of aging such as fine lines and wrinkles? If you answered yes to any or all of these questions, then you may want to consider squeezing in an extra serving of this vital protein! I will be honest, I don’t fall for health fads easily. I rarely take any supplements other than protein powder, multivitamins and collagen protein. However, collagen protein has been a game changer not only in my skin, hair and nails but it has also helped me reach greater fitness goals by reducing joint pain and helping with muscle recovery. So, to help share my enthusiasm with this vital protein, let’s first talk a little about what exactly Collagen is and what it does for our bodies, from the inside and out. If you want to skip the science behind why collagen is beneficial, keep scrolling to the 10 benefits of taking collagen! **Note: This article cites sources from scientific publications and is accurate to the best of my knowledge. However, the article itself has not been evaluated by the Food and Drug Administration and is not intended to diagnose or treat any disease. Collagen is the most abundant protein in your body making up about one third of the body’s total protein. It is the building block of healthy joints, hair nails and skin. (1) This type of protein is essential for maintaining the normal structure, strength and integrity of connective tissue such as bones, skin, cartilage and blood vessels. The word “Collagen” is derived from the Greek word “kolla” meaning glue. So, basically you can think of it as the “glue” that holds your entire body together. (2) This is why it is so important. Collagen has actually been part of our diets for thousands of years. Have you heard of homemade bone broths? This is one popular source of collagen and actually dates back thousands of years. Bone broth is made with collagen loaded animal bones, skin and sometimes organs. When cooked over time, the collagen is released from these parts creating a collagen rich broth. If the richest sources of collagen comes from these animal parts, then it makes sense that adding collagen to our diets can help our own joints, skin and organs! The jelly-like substance that most people scrape off the top of these homemade broths is loaded with collagen. If you are not a fan of the idea of consuming animal collagen in this form, you’re in luck, keep reading. The downside of homemade broths, for some, is the time consuming process of making it and the taste. This is where taking a collagen supplement comes in handy. What does Collagen do in our bodies? Collagen is what helps keep our bodies looking and running smoothly. It also helps give our skin strength and elasticity as well as helps to replace dead skin cells. In our joints and tendons, collagen is the “glue” that helps hold the body together and may help support healthy joint movement and function. Let’s quickly look at the three most abundant types of Collagen in the body. Type I Collagen is the most common type found in the body. This type one Collagen is also very important in wound healing and gives skin strength and elasticity. Cartilage is an important connective tissue in the body. It is the fine, rubbery tissue that acts as a cushion between the bone of joints. The health of our joints relies on the cartilage that is made from type II collagen which is why adding collagen to your diet may be beneficial for age related joint pain arthritis symptoms. It also forms blood vessels and tissue within the heart. As we age, our collagen production begins to decline which is why tendons, ligaments and skin firmness gets weak. After the age of 20, we produce about 1% less collagen in the skin each year. Other lifestyle habits can also contribute to the decrease in collagen production such as high sugar diets, excessive sun exposure and smoking. Unfortunately, you can’t prevent this aging process. However, you may be able to reduce the signs such as reduce joint pain and give more elasticity and strength to skin. I can attest from personal experience that taking collagen regularly has helped alleviate my achy joints and my hair has been growing like a weed. Okay, so now that you know what the different types of collagen are and the importance of it in our bodies, let’s look at how to get more of this vital protein. Now that you have a better idea of what collagen is, let’s look at the different sources of where it comes from. Remember, collagen is naturally produced in the body but as we age, we produce much less. This is where supplementation is beneficial. We can get some collagen from the foods we eat such as bone broth. However, because the protein molecules are so large, it can be difficult for the body to digest and absorb effectively. Collagen protein powder supplements, in the form of Collagen Peptides, are much easier to digest and more readily available for our bodies to use. Bovine Collagen comes from beef and it is the most common source of collagen. It contains primarily Type I and Type III which are also the most common types in the body. It contains a rich supply of glycine and proline which is useful for producing creatine, supports muscle growth, and helps the body make more of its own collagen. Chicken collagen contains primarily type II collagen which is best for building cartilage making it excellent for joint health. How do you get more Collagen? As you can see, your body needs all types of collagen. As I mentioned before, homemade bone broths are a great source of collagen. However, the taste and preparation can deter many people (like me) who are looking for the benefits of collagen. Supplementation: If bone broth doesn’t appeal to you, you’re in luck! There are several other alternatives to getting the benefits of collagen including Collagen protein supplements. I personally put two scoops of hydrolyzed Collagen peptides in either my coffee or protein shake every single day. If you are considering supplementing, then you should compare the different types with your primary goal. Is supplementing with Collagen Protein right for you? First, consuming collagen in any form is better than not consuming it at all! However, because of the bioavailability factor, Hydrolyzed Collagen may be the best option because the peptides are more readily available to be used/absorbed by the body. Other studies have shown that hydrolyzed collagen may improve bone mineral density and thus make a difference in those who have brittle bones called osteoporosis. Have you recently had a baby and want to improve your recovery and healing? Do you want firmer skin, more luscious hair, stronger nails and healthier joints? Then the short answer is yes, supplementing with collagen protein may be right for you! Let’s quickly look a little deeper and the science behind the benefits of collagen. Now you know that collagen is a major component of your skin and plays a vital role in skin strength and elasticity. One study found that women who took a supplement containing 2.5-5 grams of collagen for eight weeks saw less skin dryness and a significant increase in skin elasticity compared to those who only took the placebo. (15). The study also stated that no side effects were noted throughout the study. Less signs of wrinkles, yes please! Do you have a hard time growing out your natural nails? What about growing your hair? Not only is this protein essential for healthy skin, but it is also important for healthy hair and nails as well. I have physically seen new hair growth after taking collagen peptides. 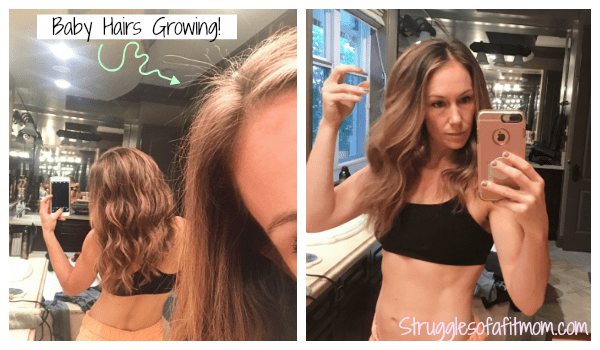 Postpartum indications: Sigh, the postpartum hair loss struggle was real. I literally had bald patches around my hairline on my forehead after the birth of my first baby. I didn’t have nearly as much hair loss after my second baby was born which I contribute to taking collagen. I’ve also noticed little baby hairs growing during my third pregnancy which means my hair is getting thicker! Coincidence? Maybe! Is it worth trying? I would say so! The connective tissue in our joints is composed of ligaments, tendons and cartilage. All of which are made from collagen. So it should come as no surprise that collagen plays a vital role in our joint health and integrity. In one study, adults were given two grams of collagen daily for 70 days. Another study showed that 73 athlets who consumed 10mg of Collagen daily for 24 weeks experienced a significant reduction in joint pain while both walking and at rest than those who did not take it. Postpartum indications- During pregnancy, our bodies release a hormone called “relaxin” which is meant to soften the pelvis for delivery. This is obviously fantastic except this joint softening hormone also softens ALL of our joints and can cause a lot of aches and pains, especially if you are active or on your feet a lot with kids or at work. Since taking Collagen Protein, I have had a drastic reduction in sever pain in my joints. Again, coincidence? Maybe. Worth trying? Highly recommended! I also take it during pregnancy to help with joint pain and overall skin, nail and hair health. I did get approval from my doctor so please consult with your physician before using any supplements. Some studies have shown that taking collagen may also help promote the production of creatine which is necessary for muscle growth. Muscle burns more calories at rest than fat so we definitely want to build and maintain as much muscle as possible to help to boost metabolism and burn more calories. Although there is no concrete conclusion to the cause of cellulite or treatment, it is known that improvements in skin strength and elasticity are two important therapeutic aims in cellulite treatment. One study (23) discovered that supplementing with hydrolyzed collagen over a period of 6 months led to clear improvement of the skin appearance in women with moderate cellulite. Predisposition to stretch marks is mostly genetic and there are very few things that can reduce the chances of getting them. I cannot claim that supplementing with collagen will prevent stretch marks but improving skin elasticity may help! Your bones are primarily made of collagen giving them strength and structure. The decrease in collagen production as we age goes hand in hand with a decline in bone mass which may lead to osteoporosis. Some studies have shown that taking a Collagen Hydrolysate supplement may have a positive therapeutic role in osteoporosis and osteoarthritis. Menopause leads to an increased risk for osteoporosis in women. One study compared women who took either a calcium supplement with 5g of collagen or a calcium supplement with no collagen every day for 12 months. Collagen hydrolysate is of interest as a therapeutic agent in the treatment of osteoarthritis and osteoporosis due to its high level of safety. (29) More studies need to be done to confirm the role of collagen supplements in bone health but I find these studies to be promising. Some studies show that collagen may reduce anxiety and improve brain function. Taking collagen may be helpful in treating conditions such as leaky gut, IBS and overall improvement in digestion but more studies are required. If you’re curious about what types of collagen supplements are the most effective, here is why I use and love Vital Proteins. I’ve researched and tried several different brands of collagen but Vital Proteins has been the one that I trust the most and have seen the best results with. So, is collagen the new fountain of youth? Could collagen protein possibly be the fountain of youth you’ve been looking for? Have you tried Collagen Protein? What have your experiences been? Here is a FREE two week guide plus 11 BONUS WORKOUTS Fitness, Meal & Goal Setting Worksheets!